When I was a boy, seeing my grandfather always made me happy. I have so many wonderful memories and he always made me feel special. I constantly think of him and wish he were still here: he really was my champion and hero, and I miss him so much. Like many, he died of cancer far too early. I believe that all people who carry with them memories like mine can understand why I have chosen to ride for this charity event in aid of Marie Curie Cancer Care. I have always wanted to do something to help those who did so much for my grandfather during his last few weeks. This is my chance to finally give something back to a wonderful charity that is always prepared to help those who suffer from this terrible disease. It would appear that there is another spate of telephone calls being made by persons purporting to be working in conjunction with the British Crime Prevention scheme, and asking for personal details about the residents and security alarms and, or cameras in place. Please be advised that no such National scheme exists. Crime Reduction Officers and Essex Police, are aware of these bogus calls, and we are carrying out an investigation as to their source. Should you, your Neighbourhood Watch members, or members of your community, receive any such calls. Ask the caller who they are, and for their company contact details. (It is unlikely that this information will be forthcoming). If you feel able, you can tell them that you are reporting this call to Essex Police and to Trading Standards. Do not give out any personal information about yourself, or others living at your address, and do not disclose any information as what security measures you may or may not have in place. NEVER agree to, or accept any goods or services from Cold Callers at your door, or over the telephone, without checking first. Crime reduction advice can be sought through your local Crime Reduction Officer or by contacting your Essex Watch Administrator. Theydon Bois teenager Ben Sowerby has signed up for a fundraising ‘Great Wall of China of Trek’. 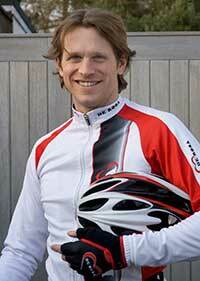 Ben 17, will be raising money for St Clare Hospice at Hastingwood when he takes part in the adventure in September. Ben decided to get involved after his mum, Sue, started fundraising for the charity about three years ago. Theydon Bois Parish Councillor Sue Sowerby will herself soon be embarking on the St Clare Midnight Walk for the third successive year. Recently Sue and some friends raised £37,500 by organising a ‘Scarlet Auction’ at Theydon Bois Village Hall to coincide with St Clare Hospice’s 20th anniversary. Ben said: "Seeing my mum raise so much money for the charity has encouraged me to help the hospice too. "I am so excited to be involved with St Clare. It’s an amazing charity helping patients and their families in the west Essex and east Herts area." Ben added: "It’s my first fundraising project. I realise I will need to train hard but it will be well worth it! "It will actually be the furthest I have ever travelled. China was always on my list of places to visit but this Trek in September just means my dream becomes a reality sooner rather than later." To qualify for the trip, in addition to the £290 registration fee which he has paid for himself by doing odd jobs at his parents’ place of work, Ben needs to raise £2,750. Please be aware of the latest scam that has hit Theydon Bois and we would be grateful if you would pass the word around about it. Some residents have been receiving phonecalls from persons who know the name and Postal code of the people that they are ringing and asking them if they have a Burglar Alarm , and if not why not , and also asking the persons age etc. The Police advice is to NOT answer any questions but just tell the caller that they are going to report the call to the Police and to put the phone down . If anyone receives such a call , please ring the Police on 0300 333 4444. This is a Mobile number , so if you have to leave a message , please leave your name and telephone number, and the Police will call you back. PLEASE PASS THIS MESSAGE AROUND. 24th March 2010 New Community Centre: The last few months have seen Parish Council meetings dominated by discussions about the Community Centre and progess in being made towards finally acquiring the site of the former Youth Club.You will see below a plea from the Councillors for anyone who thinks they would like to be involved in the running of the Centre to come forward. Our vision has always been to establish a Community Centre that will be used for a wide range of activities by groups throughout the village, catering for the needs of people of all ages. However such a venture needs volunteers, we are intending to organise a meeting next month so everyone interested can get together with representatives from the Parish Council and start working together to get the Centre established. Please do come forward, we need your help.The Website has started a new page for the community centre which will carry information and updates on progress with the centre. 21st March 2010 Parish Council Precept & Budget 2010: The Finance Committee and Responsible Financial Officer, have been, over the last few months, poring over spreadsheets preparing the budget and precept for 2010/11 to recommend to full Council. At the January Parish Council Meeting a precept of £103,280 was ratified. The budget Theydon Bois Parish Council set for the new financial year represents the financial plans, policies, priorities and aspirations for the coming year commencing April 2010. The full details are on the Parish Council News Page here. 21st March 2010 Repair Works to Theydon Bois Viaduct:This work is now being carried out because of concerns over the safety of the length of the viaduct on the west side (town side) of the London Underground railway line and over the track itself.As you may be aware, the east spans (country spans) of Theydon Bois Viaduct were strengthened several years ago but this extra work is now needed. 20th March 2010 Are You Special? : Western Division of Essex Police has a number of Special Constables, but they are still actively seeking to increase their numbers. The Special Constabulary is an integral part of Essex Police, who support their regular colleagues on front line policing in the task of making Essex safer, in line with the Chief Constables pledge to the people of Essex. Anyone can join from the age of 17 and 9 months, as long as physically fit and in good health and are able to give 16 hours minimum per month, plus training. Each volunteer receives training in all aspects of police work, to equip them to carry out their roles effectively. Once they have received the initial training at Essex Police Head Quarters, which is covered over a total of 16 days, They will be posted to the Division of their choice. Duties will vary around the hours that you are able to commit. Duties will include a number of varied tasks including mobile patrol, foot patrol, special events and general police duties, all of which include communication with the public, which is a vital aspect of police work. This is a very worthwhile and rewarding role as part of the Essex Police family and a small commitment for a great reward, it is an ideal opportunity for you to give back into your community. Recruitment Open Evenings for 2010 are at the following locations: Brentwood, Harlow, Ongar and Loughton. The Loughton ones are as follows: Loughton Police Station, 158 High Road, Loughton. IG10 4BE. Time: 8pm Date: Tuesdays: May 11, Nov 9.For more information about Specials visit the Specials Page of the Essex Police Website. You are welcome to contact Special Superintendent Debs Rudd on 07715 771098 or by email at debi.rudd@essex.pnn.police.uk; if you have any queries prior to attending. For more information on the Loughton Festival click on the logo or contact info@loughtonfestival.org.uk or phone: 020 8508 2512. 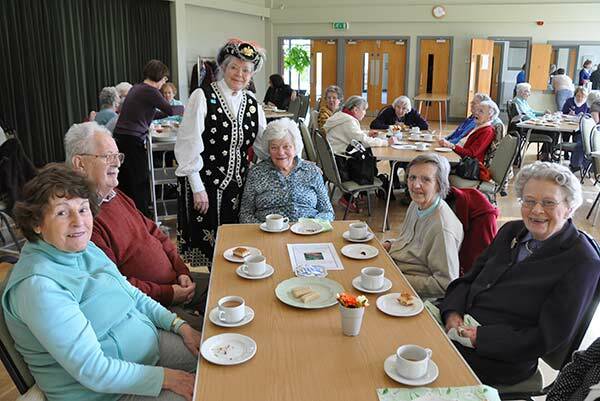 Theydon Bois Parish Council held their third ‘Afternoon Tea’ for elderly and less mobile residents, or our Senior Residents as they may prefer to be called, on 12th March. Forty or so attended and enjoyed tea, cake and a chat, and sang along to songs from 1850’s – 1950,s from ‘Pearly Peggy’ – there was even some dancing! 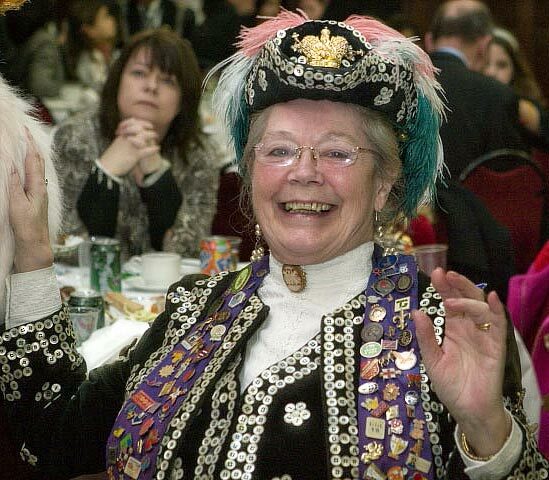 Peggy Oliver, a resident of Chigwell was Crowned Original Pearly Queen of the London Borough of Redbridge, and has now completed in excess of 25 years of talks and entertainment events both in and out of the Borough. Fees or donations ‘earned’ are kindly passed on to various local charities. In 2001 and 2008 Peggy was awarded a ‘Lifetime Achievement’ award from the Borough Mayor for services to local charity groups specialising in the handicapped, youth projects and the elderly. In 2003 Peggy was invited to a Buckingham Palace Garden Party, was honoured by Redbridge Council and entered on the Civic list and in 2006 she completed 29 years as the Borough Pearly Queen. There is never a dull moment, with visits to hospitals, residential homes for the elderly or handicapped, clubs, organisations and schools. The next ‘tea’ of Strawberries and cream will take place on 11th June at the Village Hall from 3pm. We have yet to organise some entertainment but hopefully if the weather is nice we can sit outside and enjoy some summer sun!Please call Sally or Greville at the Parish Office on 01992 813442 to book your place, or if necessary to reserve a place on the bus! Anyone wishing to help out on the day, please also come along or call the Parish Office for more details. Peggy was such a success requests for her return have already been received we hope to invite her back in the near future! 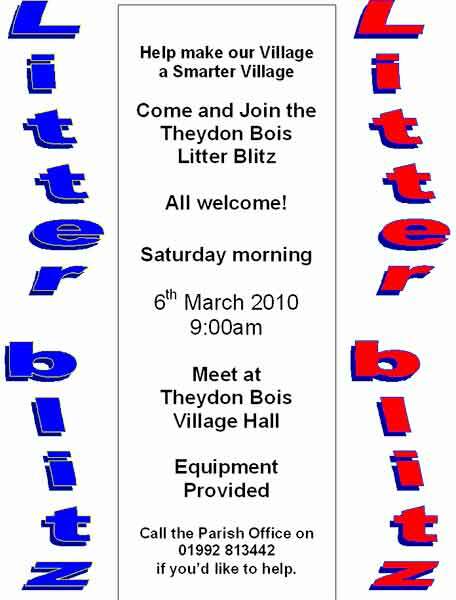 16th March 2010 Theydon Bois Rural Preservation Society: The Society Organises a number of guided footpath walks each year to explore the fields and forest surrounding Theydon Bois. These are free and are on Sundays in April, May, June, July and September starting at 2pm from the Village Hall. Dogs are welcome but must be on leads at times on some of the walks. Stout footware is advisable as the ground can be uneven and sometimes is muddy. Walks last from 2 to 21/2 hours and cover a distance of about 4 miles, the September walk is slightly longer but can be left at a number of convenient places. May 2nd 2010 Earthworks – ancient and modern. 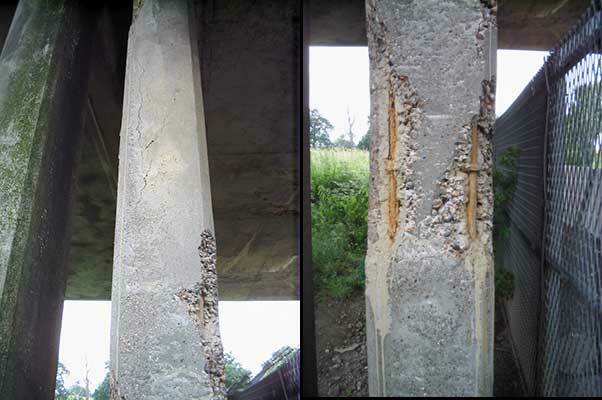 June 6th 2010 Country Estates – then and now. Sept. 5th 2010 Around the village boundary. 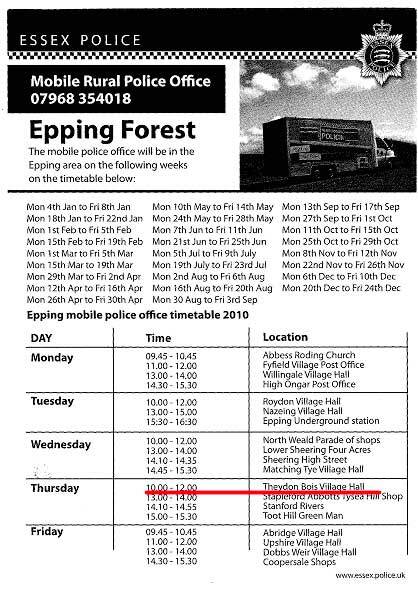 The Society's AGM will be on Thursday 1st July in the village hall and this will be preceded by a free talk by Paul Tomson the Superintendent of Epping Forest. There will also be an opportunity for villagers to ask him questions about the future plans for our village green etc. 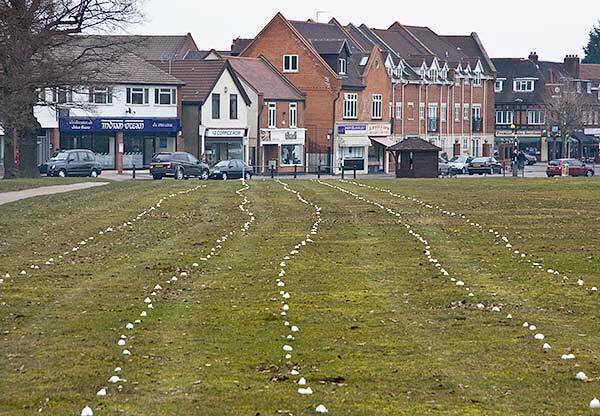 Many Villagers were found scratching their heads in bewilderment when strange white foam blobs appeared all over the Village Green. The answer was that the City of London Conservators, who are responsible for our green where de-compacting it by aeration. Many of the grass areas of the green have severe compaction caused by foot traffic etc. The severely compacted soil was injected with compressed air from a special injection machine. This was done at a spacing of just over a metre indicated by the white blobs grid pattern. 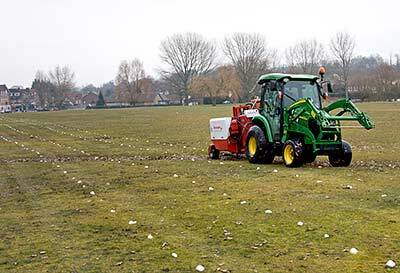 Proper aeration ensures that compaction is broken up over the whole underground area and fractures and fissures are created providing air channels from one metre depth to the surface. This will ensure the the grass returns tip top condition later in the year and also improve the soil for the planned future tree planting. 10th March 2010 Cancer Research "Race for Life":Last year Team Theydon raised almost £2,000 and so after this massive success we are hoping to do the same in 2010. The Race for Life, a Cancer Research UK fundraiser is open to ladies and girls of all ages & is a 5km walk or run (most of us walk!!). Last year almost 30 girls from Theydon took part & we are hoping that even more will join us this year. If you have taken part in an event like this before you will know the atmosphere is amazing & the team spirit second to none. But aside from the fitness and friendship on the day it is an excellent way to raised money for Cancer Research UK. 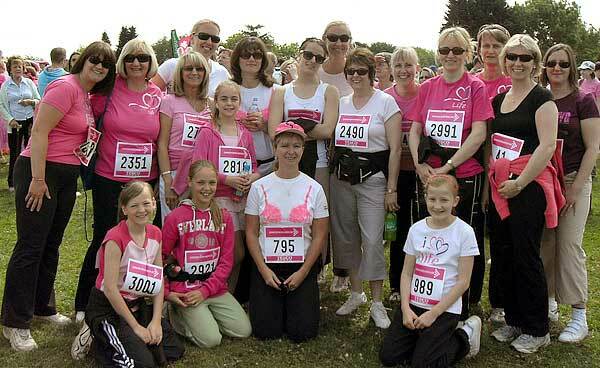 The one most of us are going for is the Harlow 5km on 9th May (the one highlighted) but please enter whichever one suits.So we'd love you to join us or sponsor us, whatever your reason – to celebrate or remember a loved one who's suffered from cancer or to just to be part of or support this fantastic fundraising event. If you will, please log on to www.raceforlife.org to register (or simply press ctrl over the name of the race venue above) and please, please email this and tell as many Theydon ladies/girls as possible & encourage them to join in or sponsor us too.Our Theydon Bois fundraising page is: http://www.raceforlifesponsorme.org/teamtheydon which you're welcome to use as your own if you want. If you do join, would you mind letting us know so we see if we can break last year’s record. 16 Piece Big Band on stage in Full Authentic AAF Uniforms of WW2 - Playing the Music of the 40's including Glenn Miller, Sinatra, Ella and Much, Much, More! Stage in Bunting, Flags & Posters. Tickets £16.50 Tel: Sue Short on 01245 450 450. B.Y.O. Drinks & Rations - Raffle - Ample Parking. Dress Code: Black Tie, Posh Frocks or 40's Dress. 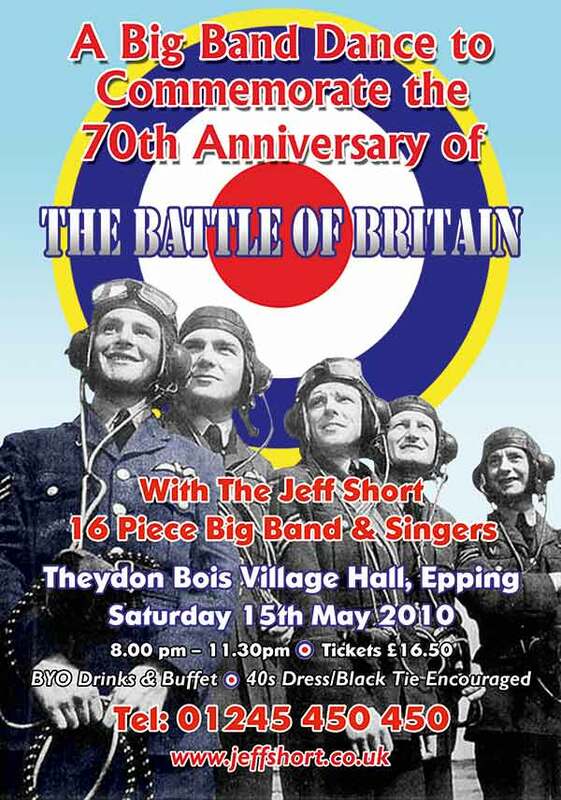 Tickets are going well so Theydon Bois villagers should book now if they want to go. 10th March 2010 Further Attempt at Constructing a Car Park on the Old Foresters Site: A survey is being carried out by http://www.easypark-theydonbois.co.uk in connection with a proposed 156 place car park on the same Green Belt site where a planning application appeal was withdrawn last year. At the end of 2008 a Planning Application (EPF/2439/08 - Land off Abridge Road) was made by Parkeng Ltd. for a very large Commuter Car Park on the Green Belt Land adjacent to the Old Foresters Club. The Theydon Bois Rural Preservation Society made a strong 11 point objection to this proposal, the Parish Council and TBAG also raised objections. Fortunately EFDC agreed and this application was refused on the 13th March 2009. The applicant then appealed to the Government Planning Inspectorate in May 2009 and objectors amplified their reasons for opposition. The applicant finally decided to withdraw the appeal on the 11th August. No formal planning application for this new proposal has yet been received by EFDC and any that is made will still have to show ‘special circumstances’ for building in the Green Belt. We suspect that when the application is finally made that this survey (no matter how unrepresentative) will form part of these ‘special circumstances’. 10th March 2010 Coppice Row Crash Victim: John Eldred, 56, of Hemnall Street, in Epping, died when he was hit by a silver Vauxhall Corsa, in Coppice Row, at about 9.45pm last Friday. The car was being driven by a man from Barking. Although our village has suffered problems with road accidents for some years the site of this latest crash, near the village hall is only a short distance from the Coppice Row speed camera. It is not a known danger area, is a straight road there and at this time of night there is light from the entrance to the village hall. Mr Eldred was taken by ambulance to Whipps Cross University Hospital in Leytonstone, but died at the hospital. Essex Police are appealing for anyone who saw the car or the pedestrian before the crash, or who witnessed it, to call the road policing unit in Chigwell on 0300 333 444. A growing number of floral tributes have been left to Mr Eldred at the crash site. 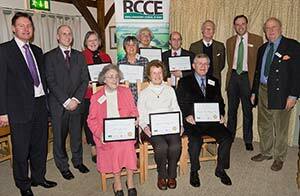 We have just heard that we have been awarded £19,979 from Essex County Council Community Initiatives Fund 2009/10. This is fantastic news as it will enable us to proceed with the necessary refurbishment of the building once we have completed on the purchase. After many years of negotiations with Essex County Council the Parish Council are pleased to announce that real progress is now being made with the purchase of the former Youth Club Building, our solicitor has received draft legal documentation from Essex County Council and we hope to exchange contracts in the near future. We have also received approval from the relevant Government Department to borrow the purchase monies by way of Public Works Loan. Theydon Bois Village Association has agreed to provide very significant financial support for the project and the Parish council would like to express its sincere thanks and appreciation to the Association for their ongoing support and commitment. It is the Parish Councils intention to set up a Charity to run the facility therefore:WE NEED VOLUNTEERS! 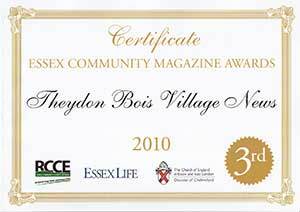 26th February 2010 Theydon Bois Village News is one of the Top Three Essex Community Magazines: Community magazines from all over Essex entered this years Essex Life Community Magazine Awards Competition run by the RCCE (Rural Community Council of Essex sponsored by Essex Life Magazine & the Church of England, Diocese of Chelmsford. Sixty five communities all over Essex had submitted their entries for the competition and our very own Village News was selected as one of the 12 finalists invited to the the awards ceremony on 25th February 2010, held at The Compasses, Pattiswick, Braintree. 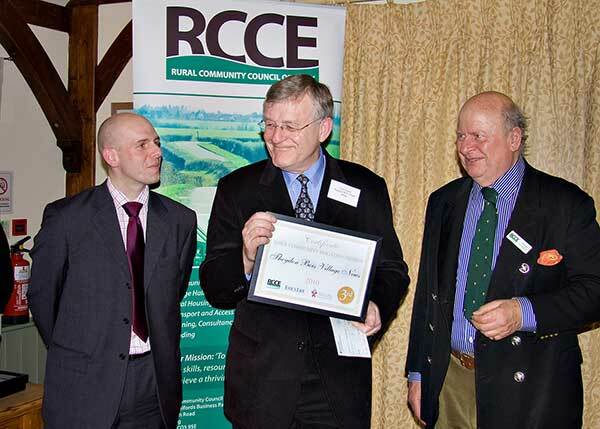 I attended along with village website editor Jim Watts and we browsed through samples of many of the entering magazines before Nick Shuttleworth Executive Director of RCCE opened the proceedings. Firstly merit awards were made to four magazines and we held our breath. Time came for the final three and we were delighted to learn that we were one of the top three community magazines in Essex along with Arkestone and St. Osyth. The editor of Essex Life, Julian Read, announced that details results and photographs of the event would be published in the April edition of Essex Life. Many thanks to all the team, from the editorial committee, to the providers of copy, to our sponsors and to the individual deliverers. All are important parts of and contribute to, the continuing success of our Village News. EFDSC is a non-profitmaking swimming club that exists to provide the opportunity for young people to learn to swim and to achieve their potential in competitive swimming. It is run by parents solely for the benefit of the swimmers. We provide swimming lessons for children of around 4 years upwards and training for competitive swimming from around 7/8 years. Swimming is universally recognised as an excellent way of keeping fit and we have an active Epping Forest 'Masters' section. Whilst EFDSC is a small club compared to its London neighbours it is huge on success. 2010 has started well with outstanding performances at County level, great expectations at the forthcoming East Region Championships In Norwich and for the first time in many years the club will be represented at the Nationals in Sheffield. We also have a thriving disability section with a number of swimmers on the British Disability Swimming World Class Pathway programme, competing at National and International Level. 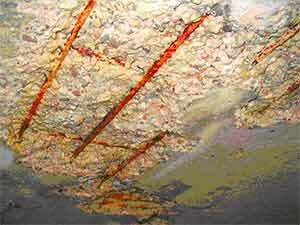 Costain has been carrying out refurbishment works on Bell Common Tunnel. They are near completion and it is anticipated that they will complete the work approximately 2 months ahead of programme. The current phase of the works is nearly completed. This phase of works has concentrated on the commissioning of the mechanical and electrical works; communication systems and the environmental control systems of the tunnel. The current traffic management has included the running of 3 full width lanes in each bore at 50mph. It is the intention in March to return the Motorway to full operational service in the Bell Common Tunnel. This will include the removal of the traffic management, the removal of a free recovery service and returning the speed limit to 70mph. It will be necessary to continue to reduce the lanes available at night to enable access to elements of the project to complete some minor commissioning and minor work activities. This will culminate with the emergency exercise night time closure and testing of the integrated system over the night of 17/18 April 2010. Costain Limited apologises for any inconvenience caused by the works. They would like to take the opportunity in thanking the local community for their patience during the refurbishment works. If you require any further information or need to contact them, please leave a message on 08456-037-985 or e-mail Ann Gout the Public Relations Manager: BCTinfo@costain.com and one of the team will contact you. It is now less than two months before the Club commence their 2010 season and, as usual, applications for playing membership will be welcome from all ages from eight upwards regardless of ability. You will be joining a progressive and sociable club in beautiful surroundings. Social membership is also available for anyone wishing to support the Club on a non-playing basis. Details of the Club can be found on our website: www.tbcc.co.uk or call Club Secretary Peter Gooch on 01992 812908. School Years 1- 6: £4.50 per session, course of 6 payable in advance at beginning of each ½ term total £27.00. Secondary School/Young Adults: £6.00 per session, course of 6 payable in advance at beginning of each ½ term total £36.00. 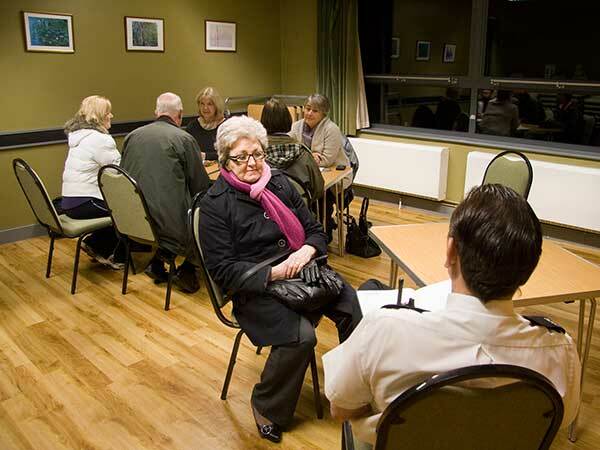 One-2-One consultations once a month at the Village Hall. This is your opportunity to tell us what is happening in the village – good or bad. 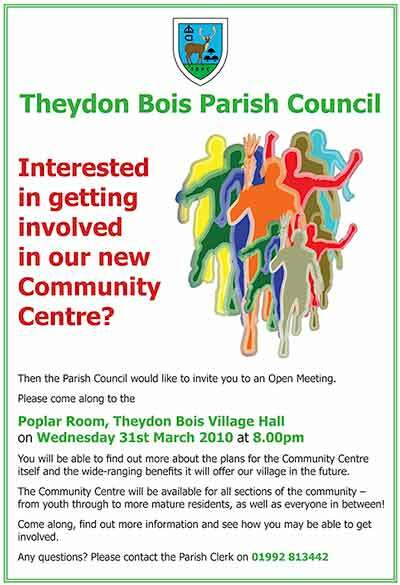 If you have issues or concerns that you would like to be addressed, come along and discuss these, in confidence, with a Theydon Bois Parish Councillor. PC Andy Cook has advised us that since 1st January there have been a much higher number of burglaries in the village than average. He tells us that these have comprised thefts of relatively small easily concealed items such as cash, jewellery and laptops. There is no particular pattern; some incidents have been in the afternoon, some in the evening and even some at weekends. Also the problem is apparently village wide and is not limited to any particular roads. In accordance with the Government's Directive, the Theydon Bois Neighbourhood Action Panel was formed, so that local people are able to assess the different concerns requiring Police or Partner involvement, and to establish priorities for Policing in our area. The Panel is composed of local residents and members of our local Policing Team. New panel members ,of any age, will be made very welcome at our next meeting which will be held on Tuesday 20th April at 7--30 at the Village Hall. Meetings are held every other month and usually last for about 1hour or so. This group is not connected to Neighbourhood Watch although a representative from Neighbourhood Watch is on the Panel. If you would like to know more , or have any queries please contact PC Andy Cook on 0300 333 4444 or Caroline Law on 01992 813905. After many years of negotiations with Essex County Council the Parish Council are pleased to announce that real progress is now being made with the purchase of the former Youth Club Building, our solicitor has received draft legal documentation from Essex County Council and we hope to exchange contracts in the near future. We have also received approval from the relevant Government Department to borrow the purchase monies by way of Public Works Loan. Theydon Bois Village Association has agreed to provide very significant financial support for the project and the Parish council would like to express its sincere thanks and appreciation to the Association for their ongoing support and commitment. It is intended to hold a meeting with all interested parties to discuss the uses and the way forward for this exciting new Village opportunity next month. Please be part of it, don’t forget once purchased the hall and grounds will be available for the use of the community. This year’s Open Gardens’ Day is being organised by Theydon Youth with the continued support and help of the Village Association. This prestigious event, which is in it’s 30th year, is always held on the last Sunday of June. It has become an annual tradition where visitors, from near and far, have the chance to look around some of the beautiful private gardens within our Village. If you would like to show your garden please contact Karen Collins (Tel.01992 812295/E-mail ckte@btinternet.com ). If you would like more information or have a spare hour or so to help on the day then please contact Thea Buisson (Tel 01992 815982/E-mail Theydonyouth@hotmail.com). Over 110 people packed into Theydon Bois Village Hall on the 30th January for a Shindig organised by local mum Xanthe Bearman to raise money for the CLIC Sargent Charity. Xanthe Bearman & Karen Sheard at the 'Shindig'. 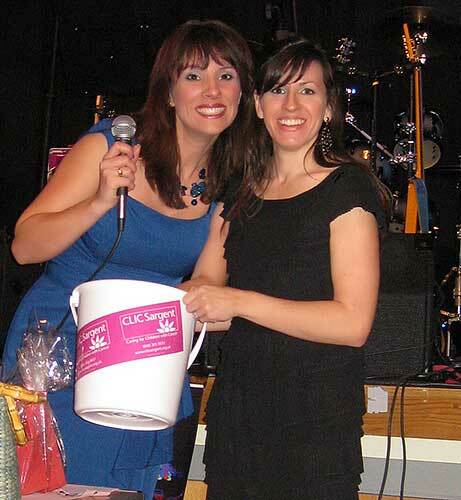 Xanthe’s good friend Karen Sheard is running the marathon for Clic Sargent this year and pledged to raise £2000. Xanthe thought that an event to help Karen reach her target was in order, and the Shindig was born! Live band The Mazers rocked Theydon Bois and had everyone up dancing. The buffet went down well and everyone bought raffle tickets. The raffle was well supported by many Theydon Bois businesses and Xanthe was thrilled with the donations – as were the winners! The total amount raised on the night was £1,400 which will go a long way towards helping children and young people with cancer and supporting their families through the trauma of their diagnosis and treatment. Xanthe commented “I can’t thank everyone enough, from the businesses who gave raffle prizes to the people who came on the night – their generosity is overwhelming”. The first of the Parish Council One-2-One's consultations of 2010 took place at at the Village Hall last Monday 1st February. Our local Policeman, Andy Cook attended this session to give advice on Police issues and he hopes to be able to attend the future sessions also. The One-2-One's are your opportunity to tell us what is happening in the village – good or bad. 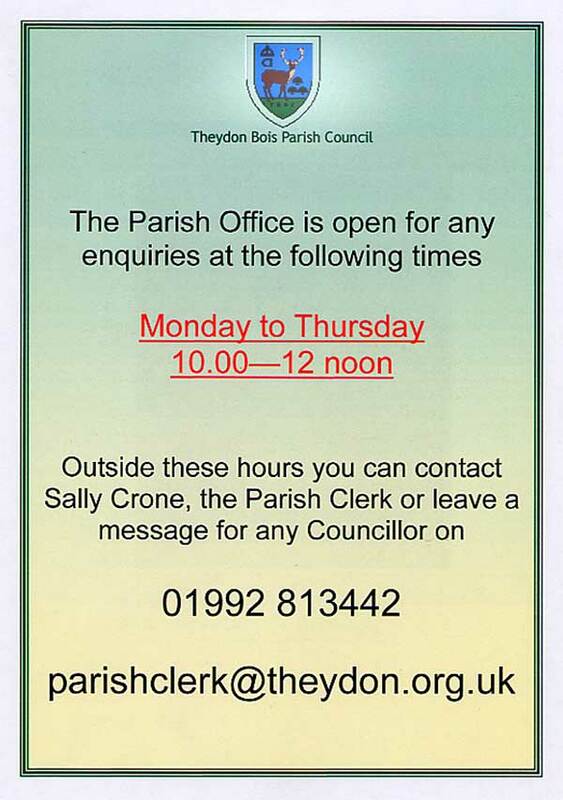 Or if you have issues or concerns that you would like to be addressed, come along and discuss these, in confidence, with a Theydon Bois Parish Councillor. The next One-2-One is on Monday 1st March. Dates - March 18-20. Performances start at 8.00 pm. Tickets - £6.50 Box office - Mr and Mrs James - 01992 812250. It's a bitter-sweet comedy about a family that has to cope with a devastating event that changes all their lives. 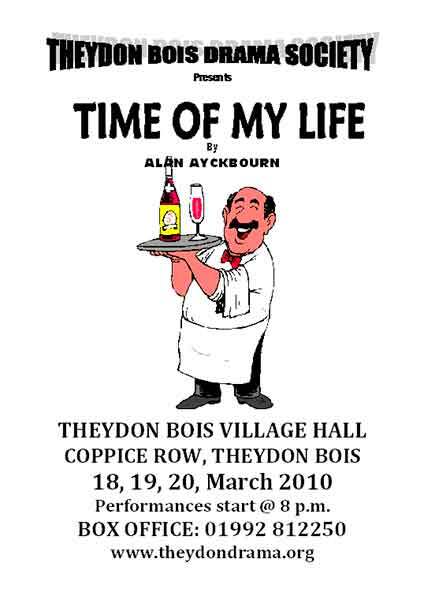 Set in a restaurant, it's one of Ayckbourn's most ingeniously constructed plays. We meet Gerry and Laura, their sons Glyn and Adam and their partners as they celebrate Laura's birthday. The play subsequently follows the relationships of the three couples, moving both forwards and backwards in time. There are plenty of laughs but a few tears as well as the family reacts to a tragic accident that occurs after the dinner party. 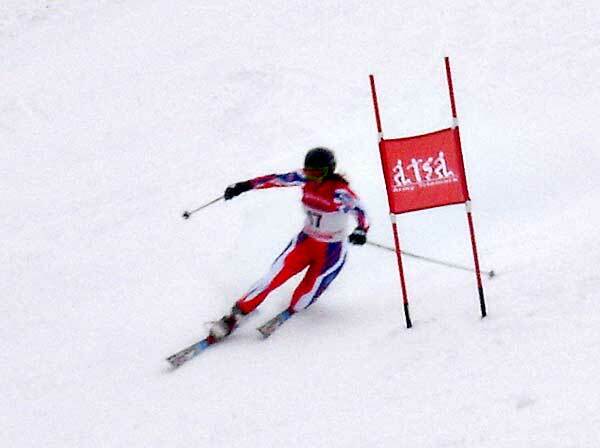 The third Army Telemark Championships was held in Rauris between 6 - 18 January. Once again, the army also hosted the Royal Navy Telemark championships, but this year the championships also formally doubled as the GB Telemark championships, for the first time. For the last three years the Army Telemark Ski Association has run the Army and Navy (and this year GB National) Telemark championships in Rauris, so when the opportunity arose to run a World Cup Telemark event over the same period it was seized with little hesitation. The event offered Service racers - the clear majority of whom have recently returned from or are about to deploy on operations - the stimulation of being an integral part of a top class event ahead of their own championship races. The championships began slowly, with snow in UK delaying some competitors' arrival for the training week in Rauris by as much as two days. Nevertheless, around 70 Army, Navy and UK Civilian skiers joined the championships. In the GB Telemark championships events Sarah Hannibal from Theydon Bois (pictured here in the British Team Colours), who we reported on in May last year as being selected for the British Team, became the Female British National Telemark Champion winning in all 3 events. Conditions were ideal for racing, for most of the week. Although the pack was generally thin, there had been recent snow and the clear, cold days made for good visibility and an excellent racing surface. The championship races were set down the Kreutzboden hill - which had hosted the World Cup event only days before - so racers found plenty of challenge in the course. Telemark ski racing makes a great spectator sport. The discipline is characterised by the graceful telemark turn and, at this top level, by the perilous and gymnastic nature of the athlete's descent. Theydon Bois Parish Council will be holding their third ‘Afternoon Tea’ for elderly and less mobile residents in the village from 2.30 – 4.30pm on Friday 12th March at the Village Hall. We are pleased to announce the entertainment for the afternoon will be from ‘Pearly Peggy’. There will be memories, anecdotes and reminisces followed by a musical interlude of songs ranging from 1850’s – 1950’s. 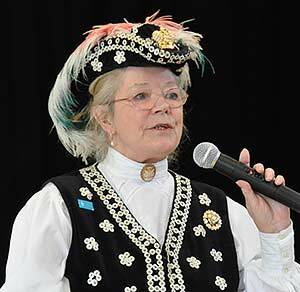 Peggy Oliver, a resident of Chigwell was Crowned Original Pearly Queen of the London Borough of Redbridge, and has now completed in excess of 25 years of talks and entertainment events both in and out of the Borough. Fees or donations ‘earned’ are kindly passed on to various local charities. In 2001 and 2008 Peggy was awarded a ‘Lifetime Achievement’ award from the Borough Mayor for services to local charity groups specialising in the handicapped, youth projects and the elderly. In 2003 Peggy was invited to a Buckingham Palace Garden Party, was honoured by Redbridge Council and entered on the Civic list and in 2006 she completed 25 years as the Borough Pearly Queen. There is never a dull moment, with visits to hospitals, residential homes for the elderly or handicapped, clubs, organisations and schools. If you would like to come along and be entertained by ‘Pearly Peggy’, enjoy a cup of tea, a piece of home-made cake and a chat, or would like a confidential one-2-one talk with a Parish Councillor, please call Sally or Greville at the Parish Office on 01992 813442 to book your place, or if necessary to reserve a place on the bus! Anyone wishing to help out on the day, please also come along or call the Parish Office for more details. The following event will be on Friday 11th June from 3pm – 5pm, if you have any ideas of what you would like to see or do please do not hesitate to contact us! This years Open Gardens Day is on the 27th of June and the organisation of the event which in previous years has been run by the Village Association is now in the hands of 'Theydon Youth' who run the village youth club. Community Transport is here to help you: the project was set up in the Epping Forest district 8 years ago for people who have difficulty accessing conventional transport. This could be because of restricted mobility, no alternative form of passenger transport and rurally isolated areas. Since then the facility has expanded and there are now six minibuses operated by a dedicated team of volunteer drivers who also use their own cars, giving up their free time to help residents of Epping Forest district to live an independent life. 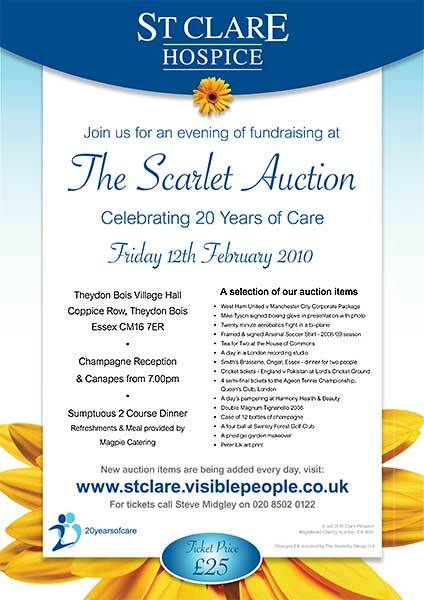 Theydon Bois Village Hall will become home to the inaugural Scarlet Auction for around 140 people in aid of St Clare Hospice. The event will commence with a Champagne reception followed by a 2 course dinner. The Auction will begin at 9.15pm. The Auctioneer for the evening will be Mr Philip Gee, a highly acclaimed charity fundraiser. The Auction will be a stunner , there will be between 50-60 lots for auction and these will include a variety of “headliners”. Our aim is to offer some unusual and interesting items in order to smash through the fundraising target of £30,000. 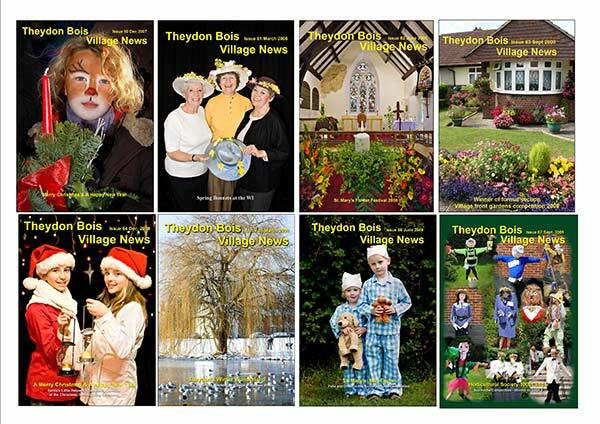 The full list of the Meetings of the Theydon Bois Parish Council in 2010 are now online here Public Meetings are at 8.00pm on Thursdays. Villagers are encouraged to attend any or all Parish Council Meetings. These are an opportunity to hear of issues affecting our village. Villagers all so have the opportunity to speak at the Bi-Monthly Public Participation Meetings. As well as meetings One-to Ones (or Open Surgeries) are held on a monthly basis where villagers can discuss matters of concern with a councillor in confidence. One-to Ones Surgeries are 5.30pm - 7.00pm on the first Monday of each Month. 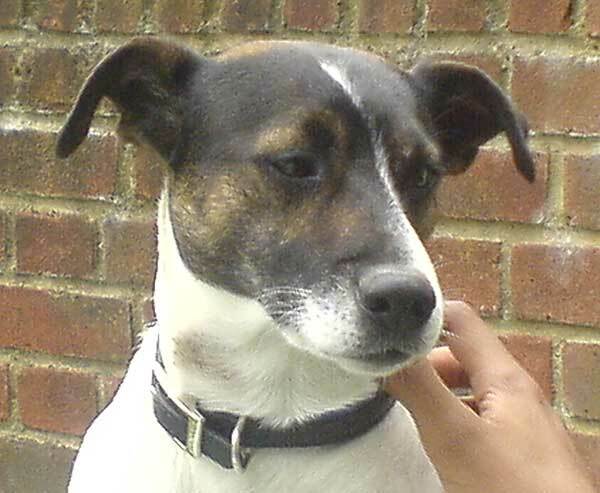 Sally Warrington & her family have lost their dog Dogger (see picture). He went missing last Wednesday during the snow & he hasn’t been seen since. He is six years old, male and all white apart from marking's on head. very friendly and was not wearing a collar, but he is chipped. They are obviously very worried and would really appreciate your help in looking out for him – especially if you have a dog and go over the fields at the back of Dukes Avenue or if you use the golf course (Sally lives in Little Gregories). If you have kids who play out, maybe you’d mention it to them too. The Epping Forest Group is a friendly local group of the national Alpine Garden Society and is for all those with an interest in alpine plants, whether in the wild or growing at home in the garden, frame or greenhouse. The Group meets every month from September to May, usually on the second Tuesday of the month in the Village Hall. Meetings take the form of an illustrated lecture or a demonstration, followed by refreshments. They now have a New Website with further information. Do you know someone who is kind, caring and helps others? If you do, nominate them for Epping Forest District Council's Young Citizen of the Year. Friends, relatives, neighbours or colleagues all have the chance to nominate a special young person for this award. It is presented annually to a young person, aged between 11 and 18 years, in recognition of their exceptional contribution to the Epping Forest community. Nominees must be aged 11 to 18 years old and live in the Epping Forest District. Closing date for nominations is Friday 22 January 2010. For further information see this EFDC Website page. Michael Chapman, a former resident of the Village, was elected to the post of Verderer of Epping Forest following the retirement of the previous incumbent Michael Davies, 81, after serving 25 years in that office. Michael’s role, which is entirely voluntary, will be to represent the views of Forest users on the board of the City of London which is the authority responsible for maintaining the Forest. A solicitor by profession, Michael, 64, is a resident of Epping Green, an Essex Deputy Lieutenant, the chairman of St Clare’s Hospice and Vice President of the Theydon Bois and District Rural Preservation Society. He will represent the northern parishes on the edge of the Forest; Epping, Theydon Bois, Loughton, Waltham Cross, Chingford and Chigwell. 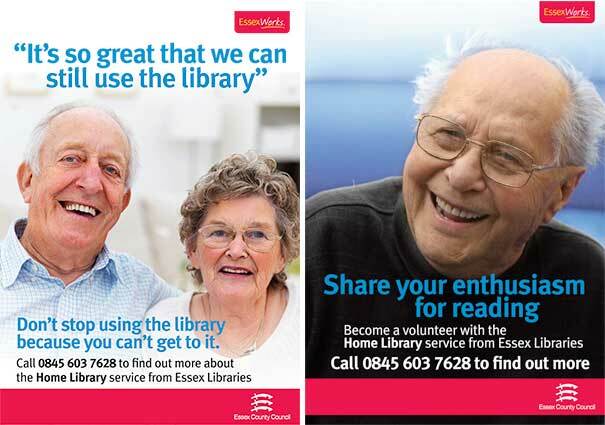 Essex Libraries runs a Home Library Service, bringing library books and DVD's to people who are unable to use a library building or mobile library. Volunteers call at members’ homes at pre-arranged times and will even stop for a chat or to offer recommendations. As well as books, including large print, Home Library Service customers can also borrow audio books, music or DVD's free of charge. Just a reminder that as from January 2010 Greville Norman (Responsible Finance Officer) will be here on Mondays from 10 a.m until 4 pm or thereabouts and I will be in the office on Tuesdays, Wednesdays and Thursdays. I will be here from 10 a.m until 4 p.m approx on Tuesdays and Wednesdays and from 10 a.m until 3 p.m on Thursdays. The office will be closed on Fridays although one or other of us may need to pop in on occasion. We will be putting a poster on the door and the details on the website. Officially the office will be open to the public from 10 a.m until 12 noon Monday to Thursday but obviously Greville and I will be flexible and if anyone turns up after 12 noon then we will always try and see them, subject to other commitments. 50+? Come and be inspired! Visit the Essex Later Life Expo for ideas and motivation to kick-start your healthy new year on Wednesday 20 January 2010 at Charter Hall in Colchester. Running from 10am until 4pm, there will be information on all aspects of healthy living, home safety and fitness. Seminars and presentations will provide tips on improving your wealth and overall wellbeing and live demonstrations will offer the chance to join in with some fun activities. Advice, ideas, motivation and inspiration and all for FREE! With over 40 exhibitors taking part, the Essex Later Life Expo is the opportunity to get advice and new ideas directly from the experts; covering a wide range of topics from gardening, arts, crafts, leisure, cooking and travel, to further education, health, transport, benefits and pensions, plus much, much more! Hosted by Dave Monk from BBC Essex and featuring Horticulturist Christine Walkden from BBC ‘Gardener’s World’ and ‘The One Show’, it’s an event not to be missed. Admission FREE – no tickets required! Epping Police have alerted us to a bogus Window Cleaner Operating in Theydon. If you have elderly neighbours please alert them about this danger. "A BOGUS window cleaner has been targeting elderly people in a village. Police say the con-man struck twice in Theydon Bois, on Sunday, December 13 at the homes of women in their 80s. At one address he claimed that he had cleaned the windows and charged £5. But the windows had not been touched. At a second address he charged £3 but is thought to have taken about £15 by tricking the woman out of change from a £20 note. Again the windows were not cleaned. Police have urged residents to be vigilant and to call them if they are approached by a stranger claiming to be their window cleaner. The man involved was white, aged about 40 to 50, about 5ft 10ins tall, and had short dark hair. He was wearing a grey jacket." Anyone with information should contact Epping police station on 0300 333 4444. 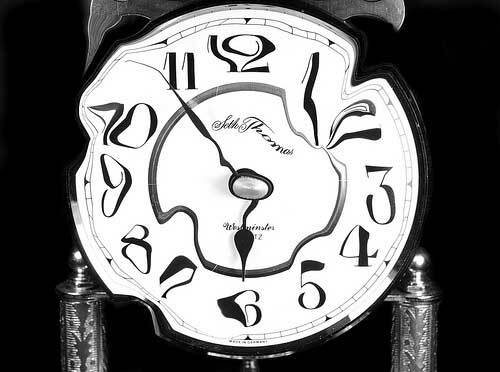 Time is running out …….. The Prime Minister must call the General Election in the first half of this year. So make sure you don’t miss out by not having a vote. Who goes? Who stays? You decide. There will be a General Election shortly so make sure your name is on the electoral register. Those of you who live in Buckhurst Hill, Epping, Loughton and Theydon Bois will also have District Council elections on 6 May. At the moment, you might not be thinking about voting on polling day but if you change your mind nearer the time and you aren’t registered, you might be too late to do anything about it. If you have recently moved, will be 18 before June (the last month for the election) or think your name might have been missed off at the autumn canvass stage please check the register by calling 01992 564411. To be able to vote you must be on the register so check now before it is too late to make any changes to the register. Don’t delay – check today Remember - no vote, no say! Ellie is at present updating the Youth Pages. If you have any news for her about your Youth Group and its activities she will be glad to hear from you. She will also try to include anything you would like to see on these pages. The deadline to be included in the latest update is 27th January, but you can send information at anytime. She can be contacted on the email address below.